Finished this quilt for the local quilt shop where I work. I always volunteer to make the quilts from Sandy Klop‘s American Jane collections for the shop. 🙂 This one is from the Punctuation collection. I think I’ve lost count of how many American Jane quilts I’ve made. You can see some of those other quilts here, here, here, here, and here. Yep, I’m a groupie. This one was inspired by Sandy Klop’s own quilt design. We changed it slightly to use the fabric that we still had available so that we could make kits for the shop. For some reason we had a lot of the black prints left so we incorporated those. I love how they look – kind of a classic black-board feeling. Speaking of Sandy Klop, I am going to a quilting retreat in March where she will be teaching a class. When I found out she was going to be there, I may have squealed like a 14-year-old girl who found out she was going to meet Justin Bieber. And I’m not really a squeally-type of girl. POST EDIT: (Sorry, should have added this originally.) These kits will be available at American Quilting in Orem, UT by Tuesday, January 18. For details you can contact the shop at 801-802-7841. Adorable quilt. And she is just the sweetest! I&#39;m sure you will have a ball at your retreat! Beautiful! When I have kids someday i definitely want to make this for them. It turned out so cute. I can see why you volunteer to work with those adorable fabrics. Love the tickets! So jealous about your quilt retreat! By any chance, is this a kit? Oh My!! That makes me want to make one…It&#39;s awesome! Oh my! I would totally love to buy this kit!! Are they available and if so, what is the name of the quilt shop? That quilt is beautiful and I love how it turned out! Wow! I love this quilt! I would keep it for myself! How, oh how are you going to survive until March?? ?<br />Seriously wonderful quilt, BTW! Yay!!! Great quilt, and oooohhs &amp; assaying overa quilt retreat!!!! That ticket fabric is fabulous! I have this kit with different borders. I usually don&#39;t care for black but your border is really pretty! Gorgeous! I bought this quilt kit from Sandy&#39;s website last week and am patiently waiting for it to arrive. It comes in the sweetest little tin. I am going to make this as a wall hanging for my little Gus&#39; room. I love your version. Super jealous about the retreat! So cute! Love the vintage school look. Very cute quilt – and that&#39;s super exciting about your retreat!! I love this quilt! Each time I visit your blog I think the quilt you have featured that day is my favorite and then I see the quilt you feature the next day, and I am in love all over again! How cute, Amy! And I think I have some similar fabrics around here – Now I&#39;m going to have to dig them up!! I love how well the black frames everything – just like you said – like a classic blackboard! This is just adorable! I went right out and bought myself the panel and some fabric to try and make one. I like the black borders too, I think you picked the perfect print! I forgot to ask…would you mind saying how wide the border frames are around the alphabet blocks? Thanks! 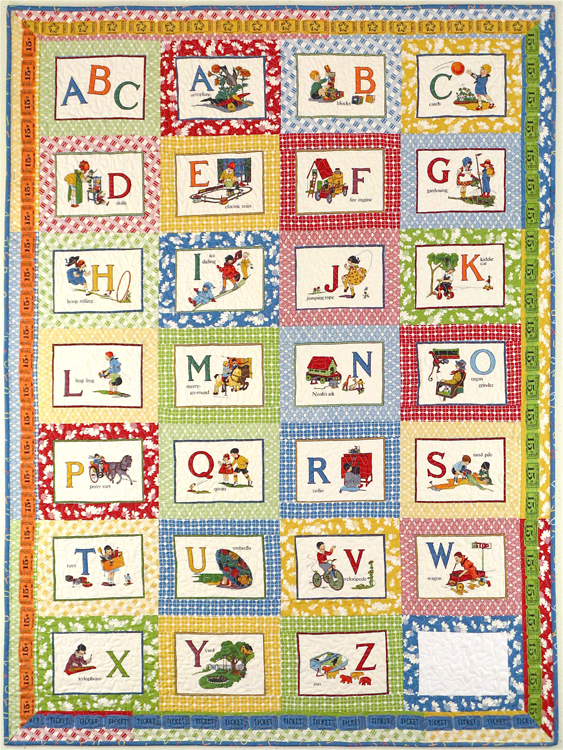 This quilt will make some lucky child very happy, it is darling. Will check the kits out. This quilt is SO cute, and I just love the black boarder. So glad you liked the quilt! @Kim – I&#39;d be happy to share the pattern measurements. Shoot me an email and I&#39;d be happy to share. That goes for anyone else too!